DUSHANBE (Asia-Plus) — By president’s decrees issued on January 20, several cities, districts and settlements in the southern Khatlon province have been renamed. Having purged Tajikistan of most Russian and Soviet labels, the authorities have begun targeting places with names of Turkic origin. Some had their former Tajik names restored, some were named after historic Tajik figures, and others were given new Tajik names. The city of Qurghon Teppa (an Uzbek name), the capital of the Khatlon province, was renamed Bokhtar (باختر). The city of Sarband was renamed Levakand. The district of Bokhtar was renamed Kushoniyon. The township of Vose, the administrative centre of the Vose district, was renamed Hulbuk. Besides, several villages in Vose and Yovon districts have been renamed. In 2015 alone, a number of large cities and districts were renamed in Tajikistan. The city of Qairoqqum, an Uzbek name, for example, was renamed Guliston (گلستان), or City of Flowers. An artificial lake by the same name was simply called the Tajik Sea. The district of Ghonchi, a name with Turkic roots, was named after Devashtich, a Sogdian ruler of the modern-day Tajik city of Panjakent in pre-Islamic Central Asia. Jirgatol district in the Rasht Valley had its old, Turkic-rooted name, Lakhsh, restored. 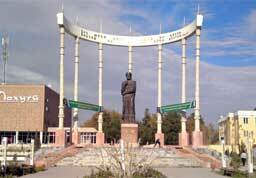 Jillikul district in Khatlon province had its Kyrgyz name replaced with Dousti, which means friendship in Tajik. It’s not just Turkic place-names that are being targeted. The city of Chkalovsk was renamed Buston (بوستان), meaning “Blooming Garden. The authorities also changed the district of Tavildara’s Arabic-sounding name to its historical name, Sangvor (سنگوار).